This historical novel, published originally in Japanese in 1982, features diplomatic intrigue, strong family bonds, and intense wartime suffering. The Association for 100 Japanese Books, an organization that promotes translations of modern Japanese classics, provided funds for this fine English translation. Ken Kurushima, the son of a senior Japanese diplomat and an American woman, joins the Japanese Army and becomes a test pilot for new fighters. Although he strongly supports the continued development of a high-altitude fighter with a pressurized cabin in order to stop American B-29s, the Army leadership decides to concentrate on production of suicide planes to be used in ramming attacks on B-29s. When Ken departs in a Hayate fighter to meet a B-29 squadron, he says to a friend, "I'm not a Kamikaze. If I attack I'll do it with my guns." However, when he spots a B-29 below him, he dives to make a ramming attack that brings down the American plane. Real people and events form the basis for this novel. Saburo Kurusu (named Saburo Kurushima in book) served as Japan's special envoy to Washington in a eleventh-hour attempt to conduct peace negotiations with President Roosevelt and Secretary of State Hull. Although most historians depict Kurusu's mission as a tactic to delay and deceive the Americans while the Japanese Navy prepared for an attack, Kaga suggests that Prime Minister Tojo deceived Kurusu by telling him to try to reach a peaceful settlement while never revealing the plan to attack Pearl Harbor. Just like the novel, in real life Saburo had an American wife named Alice who became a Japanese citizen when the two married. Saburo and Alice Kurusu had a son named Ryo, who served in the Japanese Army as in an experimental fighter squadron. The original Japanese title of this translated novel is Ikari no nai fune (Ship Without an Anchor), which aptly describes the Kurusu family (and Kurushima family) members as they moved to several diplomatic posts around the world before 1941. The Japanese title also portrays the lives of Alice and her half-American children as they lived in Japan during the war. The author, Otohiko Kaga, became a cadet in the Junior Army Academy as a teenager and saw his hometown Tokyo go up in flames in the last year of World War II. He started his career as a professor of criminal psychology and in his late thirties turned to writing novels. Kaga's works achieved best-selling status in 1979 with The Sentence, an epic novel about Japan's condemned prisoners. 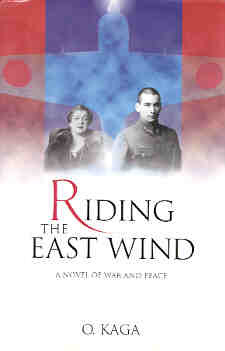 Riding the East Wind is his first novel to be translated to English. This epic novel covers events chronologically from August 1941 to August 1945, with the first half focused on Saburo's diplomatic efforts to stop the war and the second half concentrated on Ken's experiences in the Army. In addition to Saburo, Ken, and Alice as the protagonists, Kaga also carefully develops distinct personalities for another dozen or so minor characters. For example, the journalist Arizumi enthusiastically supports the ultranationalists and Nazis, which sharply contrasts with the tactful, diplomatic approach of his father-in-law Saburo. Kaga skillfully weaves historical events into the plot and accurately presents the harsh conditions faced by Japanese people near the end of the war. Descriptions of near starvation are especially heartbreaking, as many people must barter their household goods just to obtain food to survive. The book's characters present varied attitudes toward suicide attacks carried out by the Japanese military near the war's end. Ken's mother Alice expresses several times in the book her desire for her son to stay alive. Lieutenant Colonel Asai from Imperial Headquarters expresses the official military view (p. 397), "In the Philippines we've already had magnificent results with Kamikazes attacking enemy ships. If we're not willing to use suicide planes, we'd be failing in our duty to protect the Emperor." Ken expresses the opposite position held by many Army fighter pilots (p. 399), "Kamikaze tactics involve the loss of men and planes. It would be better to complete an advanced fighter." Ken gets rebuffed by a General from Air Command, "You coward! Trying to save your own skin, are you?" Ken's two good friends have different views toward the idea of suicide attacks. Lieutenant Haniyu, who played a Mozart duet with his younger sister during a visit to Ken's home, volunteers for a suicide squad and brings down a B-29 over Tokyo in a suicide ramming attack. Lieutenant Yamada, who marries Ken's other younger sister after the war, reminds Ken before his final flight not to forget his parachute and to come back alive. Even though Ken had expressed his opposition several times to suicide attacks, in the end he decides to ram a B-29 with his fighter. Kaga's brilliance as a novelist shines through even in a translation. He lets readers think for themselves regarding the truth behind certain actions and situations, since he only provides some facts and certain characters' opinions but does not give definitive conclusions. This reflects real life where people often do not know for certain the entire truth. For example, the local police arrest Father Henderson, the Anglican Church pastor in the Kurushima family's neighborhood, on suspicion of being a spy, but the reader never knows for sure whether or not the police planted the evidence. The book depicts racial prejudice in several different forms. Ken sometimes receives physical abuse in the Army for his foreign-looking face, but he has reserves of strength since he had received beatings since starting in schools in Japan when he was eight. He also recalled his time in Chicago, where children at the Japanese Consulate there were spat on, tripped up, or sworn at by children simply because they looked Asian. After Ken rams a B-29 bomber, he somehow survives after a crash landing. However, three men from a local village kill him with bamboo spears since he looks like an American soldier . With an evenhanded approach, Kaga presents a moving story of the conflicts faced by this Japanese-American family in the midst of war. The novel provides excellent insights into wartime Japan and the Army pilots who made ramming attacks on B-29s. Capt. Kurusu, born in January 1919, died due to an accident at Tama Army Airfield on February 16, 1945. When an air-raid siren sounded at the airfield, all pilots including Capt. Kurusu ran to their aircraft. As he was trying to pass in front of one plane, it moved forward two to three meters, and its propeller cut his neck. His severed head flew up two meters, and his headless body moved forward four or five more steps. This accident was unavoidable even though 1st Lieutenant Umekawa, the pilot of the plane that hit Capt. Kurusu, had fourteen and a half years of flying experience. If someone had given instructions to 1st Lieutenant Umekawa on the taxiway, this unfortunate accident could have been avoided. However, no one was giving directions to the aircraft. Capt. Kurusu was running in 1st Lieutenant Umekawa’s blind spot as everybody hurriedly ran to their planes to make sorties. 1st Lieutenant Umekawa honestly reported the accident to his commander, Maj. Yoshitsugu Aramaki. Maj. Aramaki did not say anything to 1st Lieutenant Umekawa, whose face was pale. Later, the Imperial Army leaders overlooked the accident since it was unavoidable. Watanabe, Yoji. 1999. Rikugun jikken sentoukitai (Army experimental fighter squadrons). Tokyo: Green Arrow Publishing. Yasukuni Jinja. 2003. Yasukuni Jinja Yushukan zuroku (Yasukuni Jinja Yushukan in pictures). Tokyo: Yasukuni Jinja.